How can we reduce the workload-frenzy of marking for teachers? As ‘progress over time’ becomes the new vogue for judging the quality of teaching and learning, in and out of lessons, it is important that the equivalent substitutes are counter-balanced. The trusted, excellent and wonderful @MaryMyatt also blogged on More About Marking. It appears to becoming more and more obvious, that marking has replaced ‘progress in one-off’ lessons as the latest pressure point for teachers. Perhaps even a new myth and unachievable workload for every teacher? As I look to review our school marking policy, I am keen to establish a simple common framework/expectation for all teachers across my school, as well as stipulate what is the bare minimum expectation, as well as what is unnecessary i.e. what not to mark. Eighteen months ago, deputy headteacher @MrLockyer said; “marking is broken” (2013) and I have found myself agreeing with him ever since. On the occasions I have read and spoken with Lockyer, he explains that there are five key stakeholders when it comes to marking: parents, inspectors, senior leaders, teachers and students. Here is what he says about each group with a few additional thoughts from me. Parents love reading marking in their child’s book. It shows their child has been taught and that the teacher has spent time working with them. Senior leaders also enjoy evidence of marking. Looking at marking is a quick snapshot system of identifying work output from staff and pupils. Inspectors adore marking. So much so, when they came to inspect teaching in my school into the 3rd week of this school year, they referred back to marking in books from the previous academic year! Inspectors make a valued judgement once every three years, and marking is some of the only tangible evidence that there is to demonstrate that there has been some teaching in the previous year. The question remains, has marking aided progress and have students acted on feedback? Only books and results will provide this hard evidence – this is where I believe the marking frenzy stems from. Teachers. Hands up? No teacher loves *marking. Why is this? Well, in my view, teachers are not given enough time within their directed time / workload to be able to complete the demands of marking placed upon them. This needs to change and no politician or school will be able to eradicate this problem unless a genuine workload is addressed with a budget, used to reduce teaching hours and replace this with time for planning and marking! Simple. This leaves us with a huge problem – the two key stakeholders in marking – the producer (teacher) and consumer (student) – get the least from it. How could we change this? Source: You can read @MrLockyer‘s presentation slides here. And why do I state such a frenzy brewing with marking? Well just take a look at the opening line on Myatt’s blog here on Most Commons Areas for Improvement in over 200 inspection reports! Welcome to The Marking Frenzy! Since I wrote this post in 2014 (now editing again in 2018), OfSTED can no-longer make recommendations to schools about ‘how they mark’. However, my research in U.K. schools over the past 9 months highlights teachers are still struggling under the marking burden. 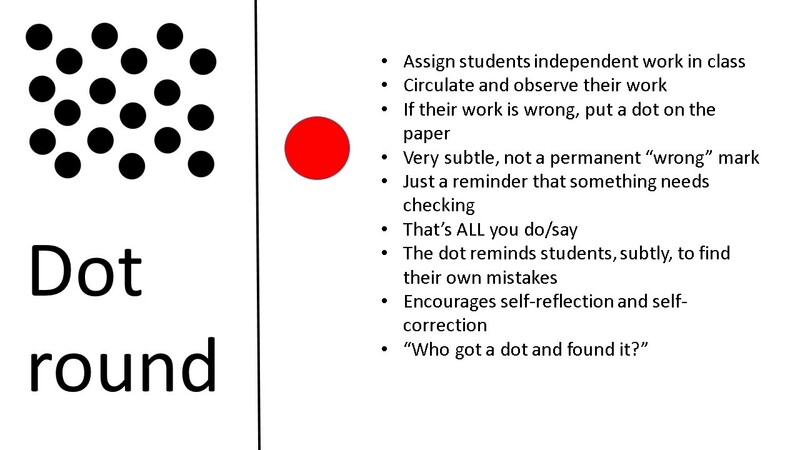 To reduce the potential marking frenzy in my school, I intend to address high quality feedback – pinpointed and sophisticated – and eradicate the ‘well done’ comments, the ‘seen by the teacher’ stamps and ask staff to focus on ‘less is more’, but not at the expense of the teacher or the curriculum to aid the observer! Should I be marking every piece of work? No! What inspections, school leaders, parents and our students should be looking for, is that there is high quality feedback which crucially is acted on by the individual. How often should we feedback? Too often what inspectors, school leaders and observers in lessons see, is feedback without any response. So, how can this feedback be helping the student progress is there is no evidence? Well, I argue that some evidence can be verbal and physical, and that not everything needs to be written in books or assessment sheets. Detailed marking for substantial pieces of work which have been developed over time. The latest publication by Ofsted, published on 17th October 2014 confirm facts about the requirements of Ofsted and to dispel myths that can result in unnecessary workloads in schools. It is vital reading. Download it here: Ofsted inspections – clarification for schools. Ofsted does not expect to see a particular frequency or quantity of work in pupils’ books or folders. For me, the answer lies within the profession. You know your students better than me. You know what works best in your school and what will aid student progress and what won’t. You also know the needs of your teaching staff and their current workload. This will also be matched alongside your school priorities and the quality of teaching and learning in your school. Assessment and marking is a huge priority to raise standards of teaching and learning in every school, but not as a stick to beat teachers with! As I review our assessment, marking and homework policies in my school, we will be working very hard to address ‘little and often’ as well as ‘quality not quantity. I have come to the conclusion that there are three factors to consider when looking at the quality of learning. Evidence of progress over time – marking has to be part of this I believe. It is also important to give students time and space to respond to this. at the heart of this the quality of the tasks set is at the heart of this. Some of our departments have recently gone for longer term tasks over half a term. For instance @spccmaths sets homework over half a term and expects all students to complete “5 cupcake tasks” from a menu of tasks. My son is in Year 7 and loves it. So setting the right tasks to enhance learning is at the heart of it! If a student has done there best in their work surely we need to recognise their effort too. What are the outcomes? Great teaching and learning lead to real progress and can be seen in results for a school, department or an individual teacher. What happens in the lesson matters – when we observe lessons we can get a snapshot of what the “diet for learning” is. It’s what happens in the classroom every day that will matter most and perhaps where the most energy should be invested as a teacher. So is there a place for making – yes. Do we need to think about it carefully to enhance learning – without a doubt. I do fear it will take some time to filter through to all schools. If we are not careful, we will yet again, end up with another myth e.g. 20 minutes progress or using a framework for judging overall QoT in individual one-off lessons! It’s important we dispel the marking myths ASAP before progress over time comes to haunt all of us i.e. constantly judged in and out of the classroom and the expectation that students and teachers need to write reams and reams of responses to each other to demonstrate dialogue in addition to the work already undertaken and completed. A common-sense approach is the best foot forward for all. It may give you some food for thought. Since I started teaching I’ve always over-marked (opinion of my previous school). When Ofsted visited in my 7th week of teaching two years ago in my feedback they highlighted the outstanding feedback they felt I provided my students. Although I know the importance of marking I often feel it weighs me down. I’ve no time to complete in school hours, so I have to do it at home. With Humanities I teach 10 different classes twice a week and 2 classes once a week, that results in taking home a set of books every night and a set for the weekend for good measure. It’s exhausting and I’m always looking for ways to reduce marking whilst still providing high quality feedback to ensure progression. I like using DIRT after marking books once a fortnight but I find that due to time limitations with the curriculum taught there is not enough time to allow pupils to go deep into their responses and redraft work. We have to get on with the next stage of learning to ensure the whole topic is taught. Is it just me that finds this? I am expected to mark everything, every week, following a prescribed marking policy made up of error codes. I annotate each piece of work with the code for each error made. I then make a positive comment and list next steps feedback: everything the student could do to improve their work and a set of correction tasks to be done at the start of next lesson. I write more than the students! A significant amount of lesson time is devoted to students completing these next steps tasks. Even more ludicrous is that I teach SEND students who need adult help to read and act upon next steps feedback. Despite the fact that the school marking policy is not really appropriate to my students, I am expected to comply and my compliance is regularly checked and monitored. Result is a 70-80 hour working week every week. This is NOT smart approach/policy. Could you ask SLT for clarification? Marking – aim for only 2-3 quality pieces of learning in books. What are some of the other ways pupils can evidence their learning. 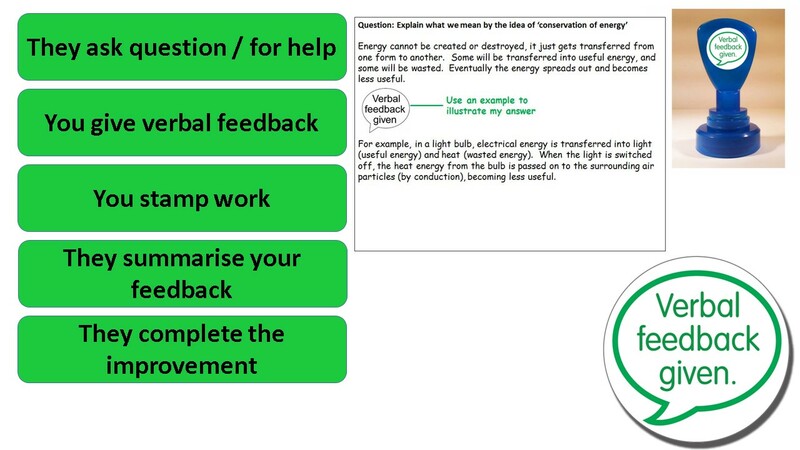 Feedback could also be from other pupils based on a simple success criteria. Marking doesn’t need to be a frenzy! We like the ‘medal and a mission’ ie something you’ve done well and a mission to improve on original. Works more for written work than say maths. Links in with Austin’s butterfly. We say that ‘ mission’ stands for ‘Make It Spectacularly Superior Improve Original Now’. Which could mean 2 mins putting full stops in or half an hour redrafting. Short missions can be done while ‘mission impossible ‘ plays in the background. But not ever piece warrants a mission. I have to agree and disagree with some of this. I really like marking and see it as one of the most valuable ways to see if what i’ve taught has actually been learned. I’m a great lover of Ski-runs and Solo, which once pupils are trained in using, can drastically reduce the ‘marking frenzy’; However, I agree that feedback (especially as I teach a hands-on subject) doesn’t have to be written. Verbal feedback is usually some of the most powerful given to children, however, until ofsted stop moving the goal posts, i feel we will always be judged against the written dialogue and communication between teachers and pupils / pupils and pupils / pupils and teachers. Another good way to document this is using marking codes, eg: ‘VF’ (Verbal Feedback) code written on a book… then getting pupils to write notes about the ‘VF’ you gave to them. I sometimes combine this with ‘TF’ (Teacher Feedback), or ‘PF’ Peer Feedback. I feel as though it’s a great way to put the responsibility onto the pupil, at the same time as evidencing that there was some interaction between the teacher and the learner. It lightens the load on the teacher and also gives the pupil to record any dialogue in a way that they understand. I have examples where I may have had a 2-3 minute conversation with a pupil and wrote ‘VF’ in the column of their work. The pupil has then made a few quick notes, added, changed and redrafted sections of the work, which stems from the conversation we had. I’d be interested to know your thoughts on the use of a V.F. code. I think the use of VF is valid if it is a prompt for the teacher. The danger is, can one recall the feedback provided and if it were acted upon; plus is it being used as an evidence trail for SLT and Ofsted? Initially ‘yes’ it was used as ‘evidence’ for SLT & Ofsted. I was really sceptical when first using it, however i find it is quite useful, especially if it is combined with a rubric or a piece of work that pupils have peer or self assessed. I have used it in books when showing pupils how to spell key words, which forms part of a dialogue and a conversation between myself and the learner. Another way in which I have used it is when I have marked a set of books (or part of) and a common misconception arises. If 3-4 pupils experience the same misconception, then I stop marking the books with pen and visually ‘ghost mark’- checking for the other pupils that have / have not grasped a concept. The next lesson is then started by the pupils that did grasp a concept, explaining how to overcome a problem / understand the concept to the rest of the class. Once again a ‘PA’ (Peer Assessment) and ‘VF’ Verbal Feedback code would be written on pupil work. Or… I would then explain the concept in a different way, re-teach it, verbally explain it and show examples of work from pupils that did understand… then get pupils to write ‘VF’ on their work. I would then either get pupils to write notes, or i would write the notes on the board, or i would already have a slip printed with notes and a new explanation- to be stuck next to the work. As you rightly point out, the next step should be giving pupils some quality time to respond to the feedback. The latest DfE report said that teachers spend an average of 10 hours a week marking homework. For science teachers we supply Educake, online homework for GCSE science. It’s saving teachers a lot of time they would have spent marking, freeing them up to spend more time with students. It also allows you to give feedback on individual student answers. Peter Clarke, Head of Science at St Paul’s Catholic College in Burgess Hill, says: “Rather than start the class collecting paper, we get straight into a discussion.” Just email me if you’d like to know more. I am feeling this frenzy at the moment. As a drama teacher I have found that it is much less simple than just drafting and redrafting work in books. In subjects like drama, music, performing arts we do always ‘re-draft’ work in the form of rehearsal. Logging this progress is much more difficult however, especially when your schools ICT infrastructure is not yet able to cope with it. I would argue that generally as teaching staff those within performing arts (and PE) are probably quite highly skilled in improving students work but without a high level of support in developing new ways of marking in these subjects we are just going to end up being penalised. We have much less to show in book trawls but it is not because excellent quality work is not happening in lessons. I think there is a need for observers to be much more sophisticated in the range of evidence that is possibly sought. i.e. student conversations, videos, performances, prior knowledge. Observing throughout the year, rather than just written records. I think there are some crucial aspects to an effective whole school policy on marking and feedback. Firstly there has to be an agreed set of symbols which are used by teachers and understood by pupils. This reduces teacher workload by preventing them having to write a comment every time an error is spotted. I think it’s quite common to have symbols that are particular to departments but it makes much more sense to use ones that are common across a school. For instance a red line underneath a misspelt word will require a pupil to write the spelling out three times. Rather than write out every spelling in each book, all spellings can be shown to pupils in the next lesson when books are returned. Also, WW is a useful shorthand for wrong word used and requires a pupil to write another more appropriate one. I could go on, but we are all have our own. The key is that there is a guide to these marking shorthands glued into every book and put up in every classroom. Secondly, we have to agree what we mark, when we mark and how. There will be variations across departments of course, but there should be agreed assessment points for all departments across the school. At the end of term for instance. As a school, we chose that our drops were always the penultimate week. This leaves the final week for feedback, re-teaching and re-drafting work. This does not have to require excessive workloads on the teachers part. There can be several agreed pieces of target work with pointers to lesson’s work that must be re-read. The teacher simply ticks these once the assessment has been marked. This review lesson is co-planned in departments and we have found it now has more impact on learning and progress than any other lesson within our fertile questions (schemes of learning). Would love to hear what other schools are doing in this area? I generally agree with the thinking here. I would throw in an observation, though, that getting the basics right can make a real difference to the pain level of marking and the usefulness/focus of it. I have seen waaaay too many homeworks/activities that are really not testing the student as desired/intended. Badly worded questions and over-repetition of things that are simple to mark are probably the major contributors to the marking blues. In passing, sitting down and spending a chunk of time in front of Khan Academy was quite eye-opening for me.